Ḥaram (Arabic: حَرَم, Holy Site), is the area surrounding a holy place with a special holiness due to its association with an Islamic sacred concept and therefore is treated differently. The most important haram for Muslims is al-Haram al-Makki in which al-Masjid al-Haram and Ka'ba are located. The next important haram is al-Haram al-Madani which houses the Prophet (s)'s burial place (al-Masjid al-Nabawi) and his house. These two are called al-Haramayn al-Sharifayn (the two sanctuaries) among Muslims. In a broad sense of the term, haram is also used for the holy shrines of Imams (a) and even for the descendants of Imams (a). The terms al-haram al-'Alawi, al-haram al-Husayni are used in accordance with this broad meaning. Haram, among Shi'a, is used for the Masjid or building which is built around a tomb. One of the special rulings of al-Masjid al-Haram, the shrine of the Prophet (s), shrine of Imam al-Husayn, and Mosque of Kufa is that pilgrims coming from other places are allowed and even recommended to do their prayers in the complete form, even though travelers normally have to do their prayers in short form. The Arabic word "حرم" (Haram) is derived from the root form "ح ر م" (ḥ r m). It means one's household or their residence that he protects from any harm. In Islamic texts, this word is applied to the area surrounding the Islamic holy sites that entering and attending there requires observation of certain rules. For example, the words "Haram", "Haram Allah" or "al-Haram al-Makki" usually refer to a specific area around Mecca. Some believe that calling such an area "Haram", is because some acts are ḥarām (forbidden) in that area. 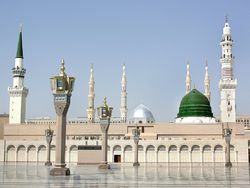 Titles such as "Haram al-Rasul" or "al-Haram al-Nabawi" refer to the shrine of the Prophet (s) in Medina. Also, the title "al-Haramayn al-Sharifayn" either refers to al-Masjid al-Haram and the shrine of the Prophet (s), respectively in Mecca and Medina, or the Shirne of Imam Ali (a) and Shrine of Imam al-Husayn, or the two holy sites of al-Aqsa Mosque in Jerusalem al-Quds and al-Haram al-Ibrahimi in Hebron (al-Khalil). It is to note that sometimes the word "haram" is used more specifically for al-Masjid al-Haram or Masjid al-Nabawi, and sometimes used more generally for the two cities of Mecca and Medina. Also, this word frequently is used for the shrines of Shi'a Imams (a) such as al-Ha'ir al-Husayni which is a title for the shrine of Imam al-Husayn (a) and al-Haram al-Radawi which is the title for the Holy shrine of Imam al-Rida (a). Al-Haram al-Makki is the most famous example of the word "haram". People who belong to this area are called Hirmi (people of Haram) and those who enter this place and put on ihram are called muhrim. The area outside of haram is called hill. Holiness of the Haram of Mecca has a very long history. According to a hadith by the Prophet (s), this area has become haram since the creation of skies and the earth and according to another hadith, Dahw al-Ard (expansion of earth) began from the place of al-Haram al-Makki. This is another important haram for which there are special rulings according to hadiths and jurisprudential laws. According to Sunni hadith sources, the noble Prophet (s) has guaranteed his intercession for the people of Medina on the Day of Judgment. There are different views regarding the expanse of al-Haram al-Nabawi. Haram (holy shrine) of Imam al-Husayn (a) is greatly venerated by Shi'a. Shi'a jurists have different opinions about the expanse of the Haram for which there are certain rulings. For example, some of them include Imam al-Husayn's (a) grave and his family members and companions except al-'Abbas (a) in the Haram, while some others believe that the whole city of Karbala including Imam al-Husayn's (a) holy darih is Haram. There is even a hadith quoted from Imam Ali (a) in which Kufa is also called his Haram. According to most Shi'a jurists, one of the rulings specific to al-Haramayn (al-Haram al-Makki and al-Haram al-Nabawi), Masjid al-Kufa and al-Ha'ir al-Husayni is the permission and even recommendation of performing prayer in the complete form for pilgrims coming from other places (passengers), although as pilgrims, they normally have to perform their prayers in the short form (al-Qasr prayer). Religious authorities regard these rulings as the conclusion of two different groups of hadiths; one which indicates that performing prayer in short or complete form in the four mentioned places are optional. And the other group which recommends the complete form of prayer in these places. In some of these hadiths, the terms "al-Haramayn al-Sharifayn", Mecca and Medina, "al-Masjidayn" (the two mosques) are used; thus, some scholars consider only al-Masjid al-Haram and Masjid al-Nabawi the subject to the mentioned rulings, not the whole expanses of al-Haram al-Makki and al-Haram al-Nabawi. Ibn Babawayh believed in obligation of performing prayer in short form in the mentioned places and did not consider any higher value for them. Apparently, his opinion is based on general reasons for the obligation of performing prayer in short form for passengers and the hadiths which have regarded it obligatory to perform prayer in short form in the mentioned places. However, other jurists have considered these hadiths as cases of taqiyya (precautionary dissimulation) and referring to some other reasons, have rejected the mentioned conclusion. There are also some other jurists who have believed out of caution, in necessity of performing the short form of prayer in the mentioned Harams. Some earlier scholars including Ibn al-Junayd al-Iskafi and 'Alam al-Huda have considered it obligatory for passengers to perform their prayers in complete form in the four mentioned places and even Harams (the holy shrines) of all Imams (a) of Shi'a. Ibn Idris al-Hilli have only added the shrine of Imam al-Husayn (a) to al-Haram al-Makki and al-Haram al-Nabawi for this ruling. Shi'a jurists have also discussed whether the above mentioned optionality in choosing short or complete form of prayer is only about the Masjid al-Kufa and the shrine of Imam al-Husayn (a) or it also includes the two whole cities of Kufa and Karbala. Hanafis, who considered it obligatory to perform the prayer in short form while travelling like Twelver Shi'a, have regarded performing the prayer in complete form in al-Haram al-Makki as following the Prophet (s). They have considered it better than performing the prayer in short form due to multiplicity of rewards for good deeds in Haram. Kiraha of moving dead people elsewhere for burial, except to one of these places. Prohibition of performing punishments or retributions in these harams. ↑ Al-Jawhari. al-Sihah. under the word "حرم"; Al-Zubaydi, Muhammad b. Muhammad al-Murtada. Taj al-'arus. under the word "حرم"
↑ Al-Farahidi, Khalil b. Ahmad. Kitab al-'ayn. under the word "حرم"; Ibn Athir. al-Nihaya. under the word "حرم"
Baghdadi, Isma'il al-. Hadiyyat al-'arifin. Jawhari, Isma'il b. Hammad al-. Al-Sihah. Beirut: Ahmad 'Abd al-Ghafur 'Atar. This page was last edited on 16 January 2019, at 11:39. This page has been accessed 103,689 times.